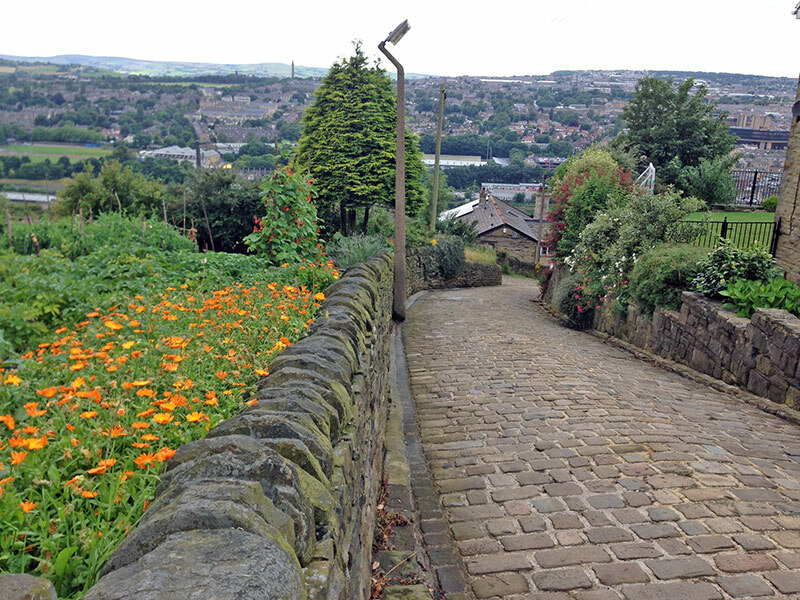 I started on Swan Bank Lane which is cobbled. After 150m you turn right onto Trooper Lane. 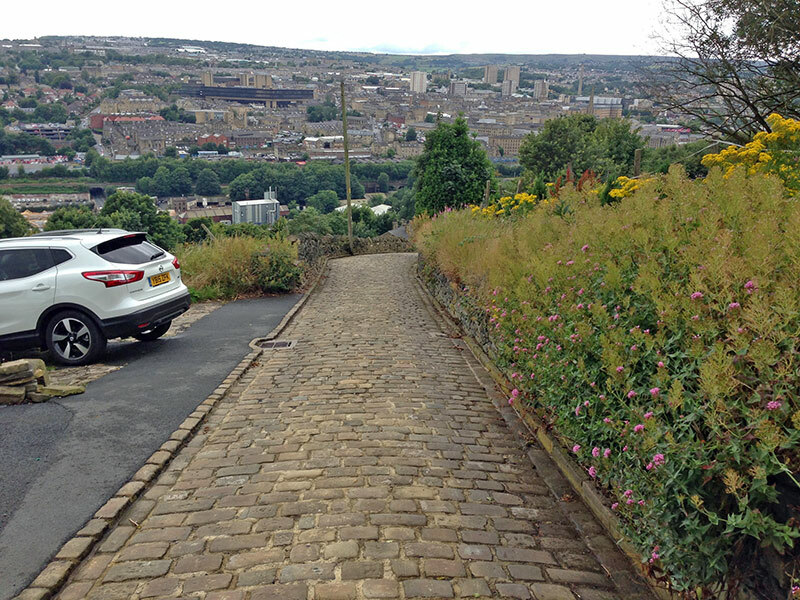 At the start it is is paved road surface, but after a couple of corners, the cobbles start. 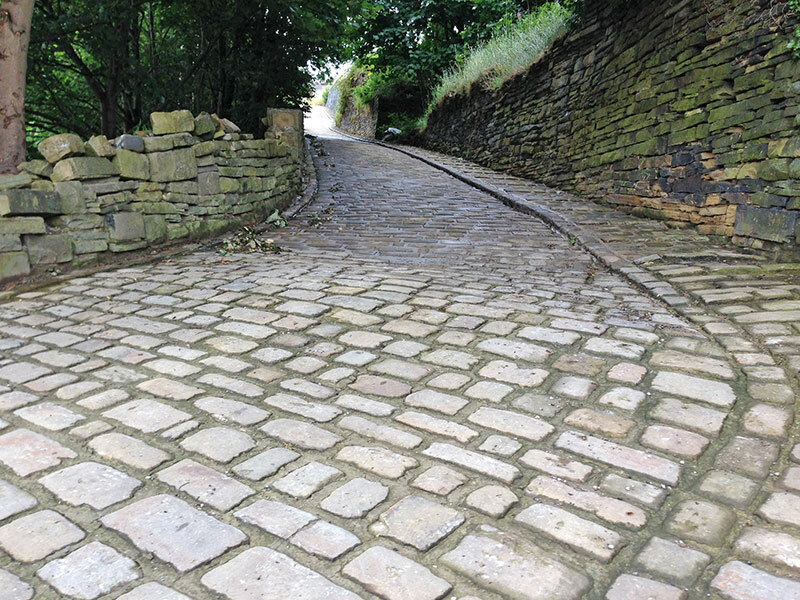 The best thing that can be said about the climb is that the cobbles are well maintained. They don’t have huge gaps like Thwaites Brow. The climb is relentlessly steep. Though, the second half gets even steeper. Here it reaches 20-23%. Perhaps 25% at some apex. There was a little moisture on the road under the trees too. A wall of cobbles, no choice but to fully commit. Make sure you have something left for this last part. I approached the climb from the top. Which meant descending Trooper Lane. This was a tough experience. 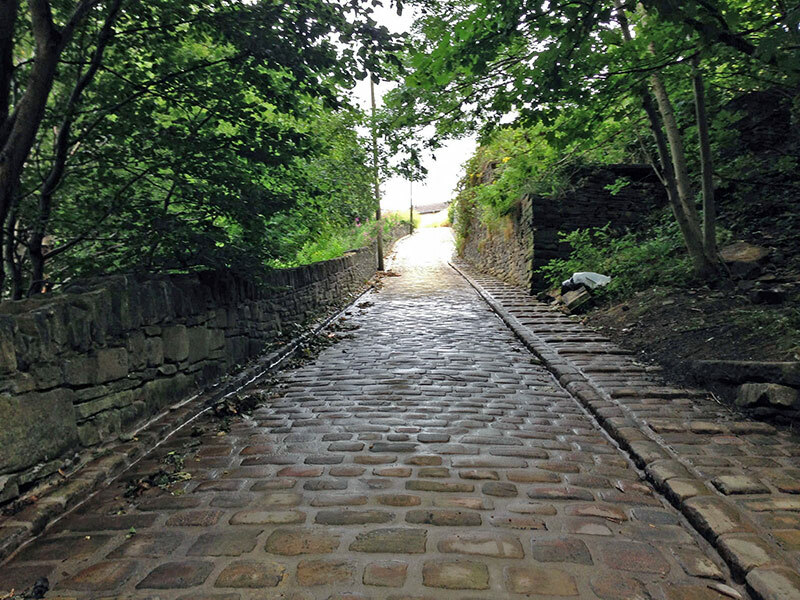 It’s harder to descend on cobbles than ordinary roads. 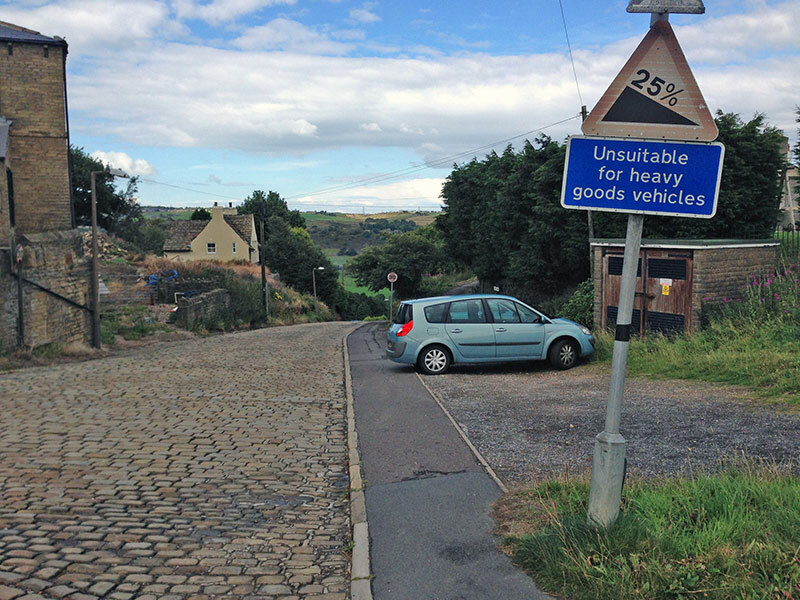 This 20% cobbled descent definitely made me somewhat nervous of coming back up. I did start to worry about coming to an abrupt halt and not making it all. My only advice is don’t get carried away on the lowest slopes. Stick it in your lowest gear at the bottom, you won’t have to worry about changing once the climb has started. I did whole climb in 39*28 at 58 rpm cadence and 6.8 mph. It was wonderfully difficult. I thought about a second go, but decided against it. Super-Trooper Lane is a real toughie. I might never go back, but it’s good to have done it once! 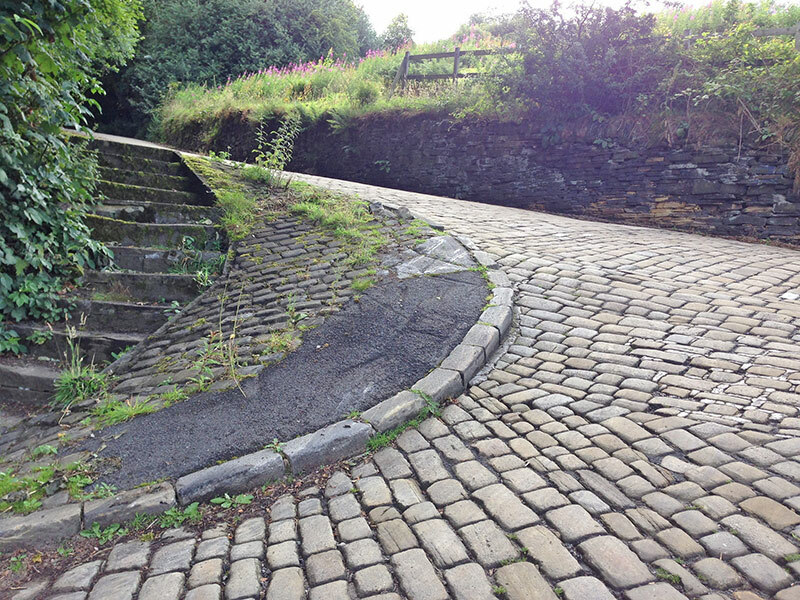 After Trooper Lane, I was a glutton for punishment and went to find Shibden Wall, another 25% cobbled climb. 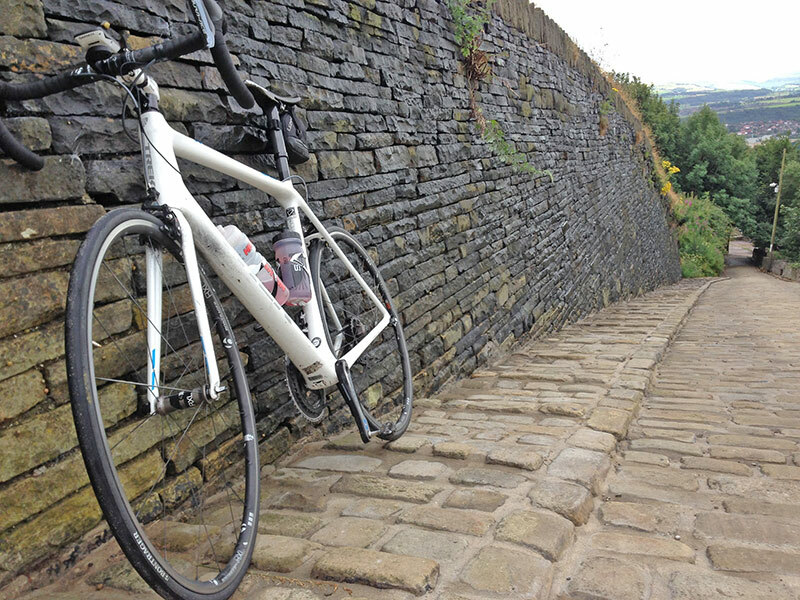 Shibden Wall is not quite as relentlessly steep, though after 1,300m of climbing it felt tough enough. Unsuitable for heavy goods vehicles is an understatement. Despite all this excitement of 25% cobbled climbs, the best moment of the ride was on the last climb from Bingley towards Bingley Moor. I already had done 2,000m of climbing, but I was going up this hill when I get overtaken by a fellow cyclist who was flying up this hill and pedalling furiously away. If you forgive the boasting – it’s not too often I get overtaken whilst cycling uphill on a training ride, so I summoned every last ounce of strength and got on his wheel. I was absolutely killing myself to keep up with his unbelievable pace. I was putting out over 400 watts to stay on his wheel, and we were flying. I also couldn’t believe how much aero benefits there were to going up a climb of 8% in someone’s slipstream. Although I’m grovelling into my handlebar to hold on, I start to twig that this bike looks decidedly chunky for a flying uphill bike. Then it all makes sense. It’s a bike with an electric motor! I held on for two minutes at this ridiculous pace. 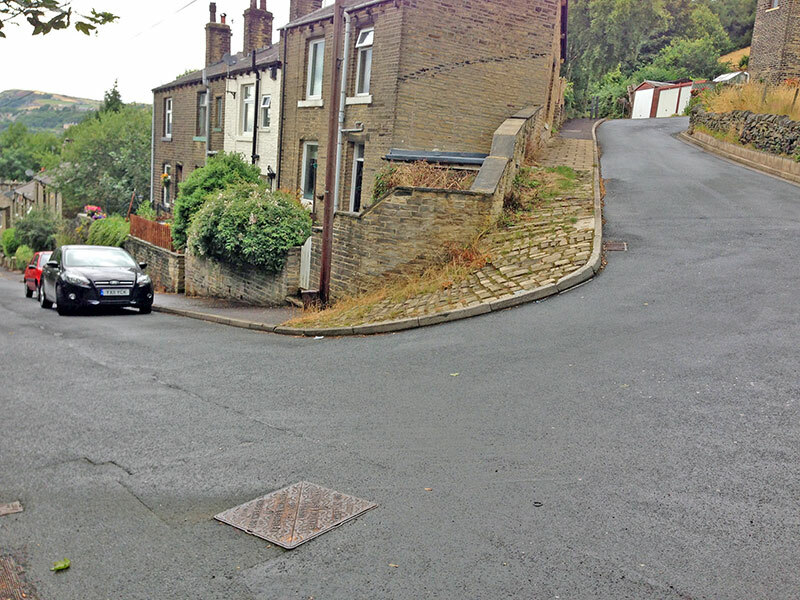 And then like I was in a road race, I just blew up and came to a shuddering slowdown on the steepest part of this climb from Bingley. The fellow cyclist looked over his shoulder to check I had been dropped. It was so much fun trying to hold his wheel. I just wish it had been at the start of the ride when I was fresh. I would have loved to have tried to stay on his wheel for the whole climb. I don’t know why, but electric bikes going up hill are to me like a red rag to a bull. If I was a professional cyclist, I would definitely pay someone to motor pace me around the countryside. I like the addition of a ‘cheery morning’ – whilst utterly out of breath – but pretending not to be. E-Bike is a brillant marketing name that hides the motor in the “E”. A bike with a electric motor on it is a motorbike. Tejvan, I do like you riding the climbs round here, as it sets a very credible benchmark on Strava. Even it does mean me being pushed further down the leader board. So can I suggest you have a go at this https://www.strava.com/segments/9703332 (Danny Lane). Less well known, but nice, I tend to it, then drop down Raw End Road into Luddenden to then go up Stocks Lane (or, alternatively, Old lane and then the other side of the valley to Wainstalls). The first section of the Buttress is Steeper! Trooper Lane is also one of the most notable sections of Halifax’s renowned 10 mile “Bluebell Trail” (running) race which takes place every May. Hard work. I can’t imagine trying to ride up it! 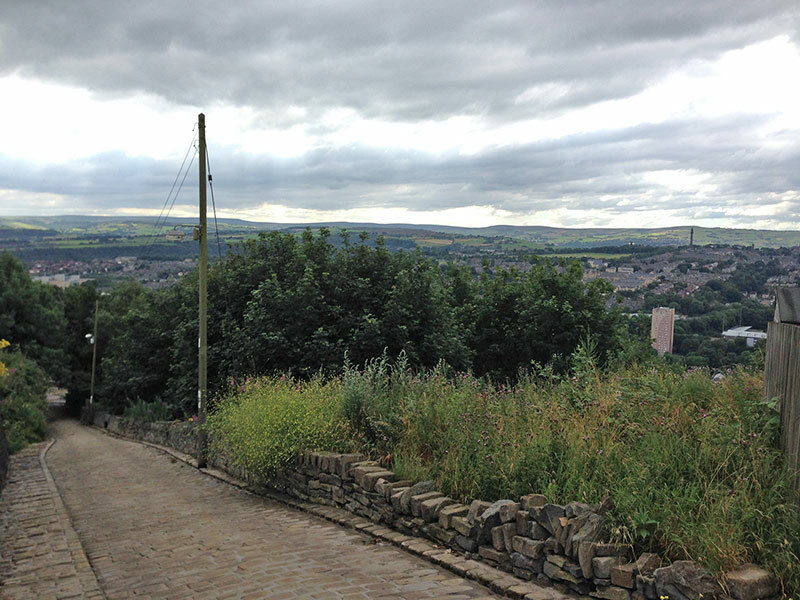 A great read as ever… I live in Bingley and have had exactly the same experience as you heading back over the moor roads. In fact I’ve come across the same guy a few times and he’s been rather ironically nicknamed ‘Motorman’ between a few mates. Of course the current challenge is how long you can hold his wheel. The real trick I guess would be to try and get him when his battery is running low, ha! I’ve ridden Trooper lane many times, usually on my commute home from work. 3 times is the most ri’ve managed in one week. My question is, where does the stopwatch start when you guys time the climb? I’m not fanatical but my time from the very bottom is usually around 6-50 while from the start of the cobbles to the end of the cobbles is 4-20. I haven’t subscribed to strava or similar as i’m a bit of a luddite!! Nice! 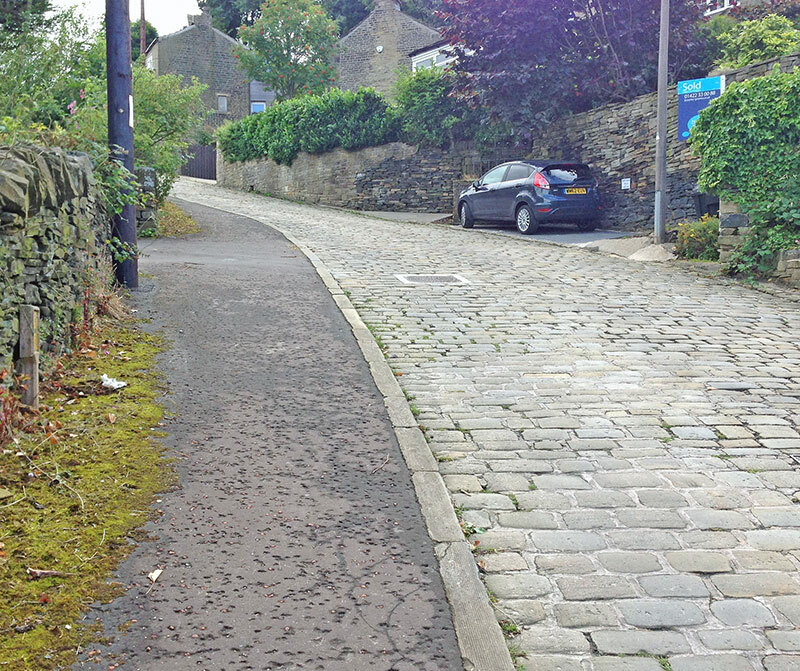 Spion Cop in Padiham Lancs, might be steeper, but a lot shorter. it’s between Ingham st and Cliffe st. and on google instant street view. 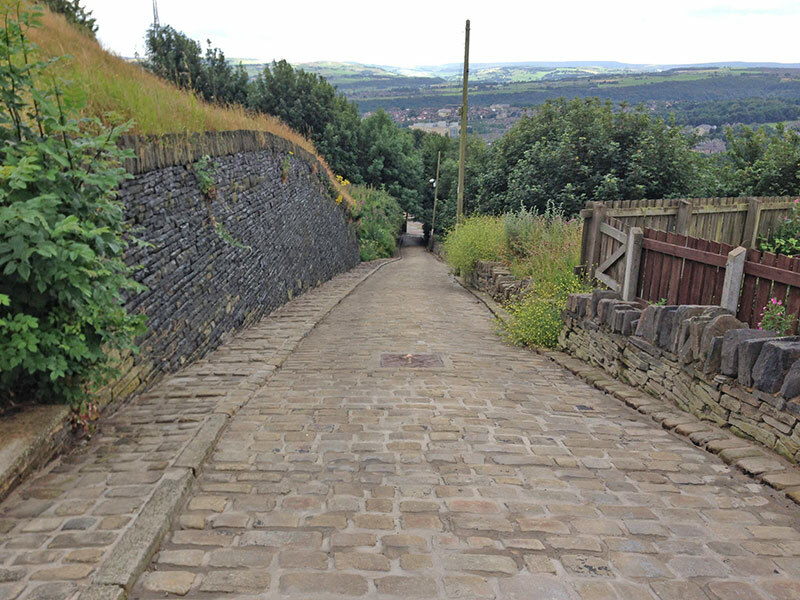 Trooper lane looks very similar to the climb from the bottom of Hebden Bridge west, near the turning circle, up on to the road that joins the Long Causeway to Burnley. I failed. Even my friend’s 3-litre BMW struggled, it’s 1 in 3 and the climb is over a mile, I think.